April is going to be a banner month at HBO for reasons that will soon become clear to you, if somehow they aren’t already. The pay-cable channel’s slate for the upcoming month is a doozy, and we’re here to walk you through the highlights, one of which casts a dragon-sized shadow over the rest of these proceedings. The title we’re teasing is, of course, Game of Thrones, HBO’s massively successful adaptation of George R.R. Martin’s A Song of Ice and Fire novels, a sprawling fantasy epic that has become one of the most ubiquitous pieces of pop culture in recent memory, not to mention a marquee TV show. 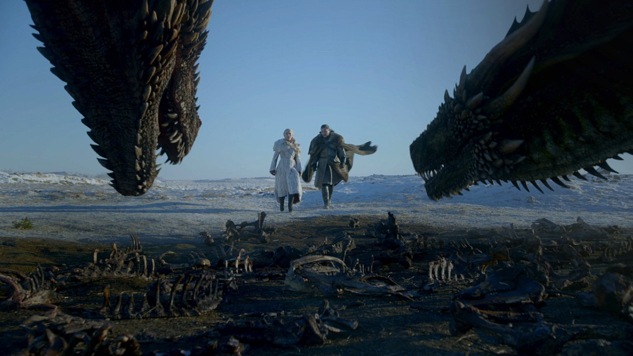 The eighth and final season of Game of Thrones, each episode of which is not far from feature-length, begins on Sunday, April 14, with new episodes weekly until the series finale on May 19, so ready yourselves for fire and blood. Elsewhere in HBO TV, we’ve got the season three premiere of Hungarian crime drama Golden Life on April 1, the season two premiere of Wyatt Cenac’s investigative comedy series Wyatt Cenac’s Problem Areas on April 5, the series premiere of eight-episode period drama Gentleman Jack on April 22, the series finale of animated kids series Esme and Roy on April 27 and lastly, in celebration of Autism Awareness Month, the premiere of six-part docuseries On Tour with Asperger’s Are Us on April 30. HBO’s April film slate ain’t too shabby, either, with a couple of last year’s best movies in the mix. Among those 2018 standouts are John M. Chu’s acclaimed Crazy Rich Asians, debuting April 13, and Spike Lee’s Oscar-winning drama BlacKkKlansman, following a week later on April 20. The month’s other theatrical premieres are spooky The Conjuring spinoff The Nun on April 6 and Amandla Stenberg-starring YA blockbuster The Darkest Minds on April 27, though those two aren’t exactly must-sees. Plenty of other films arrive April 1, as well, including beyond-quotable Tina Fey-penned comedy Mean Girls, Joel Schumacher-directed courtroom drama A Time to Kill, The Little Rascals’ 1994 outing, Ridley Scott’s medieval epic Kingdom of Heaven, Jake Gyllenhaal-starring coming-of-age drama October Sky and the 2014 Veronica Mars movie. And not to be overlooked in all this is Native Son, a new, Ashton Sanders-starring adaptation of Richard Wright’s classic 1940 novel of the same name from HBO Films and A24. HBO is losing a handful of titles in April as well, so make the most of your last chance to catch ‘em. Denzel Washington-led crime drama Man on Fire begins the exodus on April 24, followed by trailblazing superhero hit Wonder Woman on April 27 and a slew of other titles—Anchorman: The Legend of Ron Burgundy, The Thin Red Line, Phantom Thread, The Greatest Showman, The Lost Boys, Cop Car and The Mummy (no, not the fun one) among them—on April 30. See HBO’s full April slate below.